How much PROSORB do you need for your specific showcase? Air-tightness of the showcases. There is no such thing as an airtight showcase; all showcases will react to atmospheric pressure changes and temperature changes, see Michalski 1994 (1) . Even a showcase considered well fitted can have between 0.05 and 1 air exchanges per day. Even experts find it difficult to estimate. We offer a measurement kit for air-tightness for sale or for rent. Air-tightness of the case can be improved by silicone seals or our archival clear tapes. If the enclosures of your showcase consist of permeable materials such as wood you might try covering them with barrier foils. Size of the case: small showcases need larger quantities of humidity buffer than large ones. Geometry: tall showcases need more buffer than flat showcases. The ideal construction is a case with a hood made of glass or acrylic where all joints are on the same level. Humidity gradient: the difference between ambient RH and desired RH inside the showcase. If your set value is 35 – 40% RH , it will be more difficult to achieve in a room at 70% RH than in a room at 50% RH. Acceptable variation and duration of the exhibition. If your tolerance is ± 5% RH you will certainly need more than if your tolerance is ±10% RH. Performance of the buffers: there are good buffers for the 40% - 60% region (eprosorb.htm">PROSORB) and the 60% – 75% region (ART SORB). For the 30 – 40% region the available buffers (standard silica gel E or PROSORB) don’t have a very high performance, so you will need a larger quantity. Last but not least: hygroscopic construction materials inside the showcase such as wood, fibreboard (MDF… ) will seriously affect RH inside the showcase. This applies even when these materials are lacquered. All lacquers are permeable to vapour to some extent, so there will be an exchange of vapour over time. Due to their large surface they tend to determine RH inside the showcase. Try to avoid wooden construction materials inside your showcase wherever possible. Remember that all wooden materials also emit acetic acids and other substances harmful to the works of art presented in the showcase. Try to replace wooden boards with acrylic (plexiglass, etc.) or polycarbonate sheet, glass, metal, stone or other inert materials. If you cannot avoid wooden materials, try to use melamine-coated boards and make sure the cut edges don’t show to the inside of the case. Please note that acrylic glass is not completely impermeable to moisture, see Michalski 1994 (1). As a consequence, one always has to start with a rough guess of the necessary quantity (for example 2 – 4 kg / m³) and monitor RH permanently with a hygrometer. It’s good to be able to increase the quantity of buffer in case the desired RH level is not reached, or service intervals are considered too short. Therefore the space for the buffer should preferably be large with some “safety margin”. Air exchange between PROSORB and the showcase air must be good. If you put it below the bottom plate of the case there should be slits of 10 - 20 mm all around the edges of the bottom plate. For further improvement bevel the lower edges of the slits. Alternatively, the bottom plate can be made of perforated metal sheet. Large holes are preferable to many small ones, see Michalski 1994 (1). Covering of the perforated sheet by a thin fabric doesn't seriously hinder moisture exchange (only by around 10%). Make sure that the active surface of PROSORB is as large as possible to allow a quick response to humidity changes. It may be better to choose 2 500g cassettes rather than one 950g cassette. PROSORB beads should not be in direct contact with steel or zinc since the adsorbed water layer might cause corrosion. Trays for PROSORB can be made of aluminium, stainless steel, glass, PE or PP, for example. Showcase air and PROSORB should have the same temperature. If PROSORB is colder than showcase air, the RH of the showcase air will be lower than the conditioning of PROSORB. If there is a temperature gradient between PROSORB and the showcase air you might need some ventilation inside the case. Cassettes should be placed horizontally only. Sachets are dustproof and also can be turned upside down, hung vertically or horizontally, etc. PROSORB is delivered to you conditioned to a given RH, with a tolerance of ±2% RH. These values refer to 20°C. Cassettes are labeled with the gross weight at a given RH, sachets have their gross weight stamped on the top. The following instructions describe how to re-condition a PROSORB cassette or a sachet to the desired weight (i.e. the weight that is printed on the cassette or the sachet). If you want to condition the cassettes to a different RH, you can estimate the corresponding gross weight by using the adsorption values given in Table 1. But this estimation will only be approximate and should always be cross-checked with a calibrated hygrometer. Please note: all types of silica gel will lose some of their RH-regulating properties over time. Therefore the conditioning of a PROSORB cassette needs to be checked with a calibrated hygrometer at regular intervals. Initially this should be done after two years, and thereafter once a year. Depending on the measurement results, the weight of the cassette will need to be adjusted. Please note that PROSORB-beads will crack in direct contact with liquid water. Therefore all humidification must take place in the gas phase. You can humidify the cassettes by exposing them in a humid room or in a humidification chamber until they have reached the correct weight. Weigh the cassette in order to determine how much its weight needs to be increased. Take some layers of tissue paper, blotting paper or cloth and pour the calculated quantity of water onto this material. The water has to be absorbed completely without dripping at the edges. Place this humidified paper or cloth on top of the cassette and place it in a polyethylene bag. Securely close the bag and wait until the water is completely absorbed by the cassette (several days). Weigh the cassette to make sure that it has reached the desired weight. As you can imagine, the upper layers of PRO SORB will be much wetter now than the beads on the bottom of the cassettes. So mix the beads well by slowly turning the cassettes - or let the cassette equilibrate for some days. 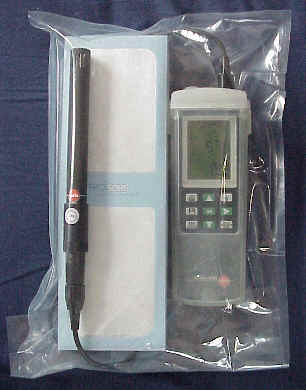 Measure the RH by putting the cassette and a calibrated hygrometer in a small enclosure such as a polyethylene bag, securely close the bag and after approximately two hours read the RH measurement (see photo). A - Heating the cassette on a radiator, in the sun or in a stove. This method is somewhat impractical because the cassettes have to be weighed at regular intervals. Weigh the cassette in order to determine how much its weight needs to be reduced. Put the cassette on a heater, in the sun or in a stove. Make sure that the temperature does not exceed 70° Celsius in order to best preserve the properties of the silica gel. Weigh the cassette at regular intervals and remove it from the heating source when the desired weight has been achieved. B - Drying with the aid of desiccant bags. The desiccant bags DESI PAK (desiccant clay) come in different sizes and are very inexpensive. Between 0% and 40% RH, one 35 g bag absorbs 6 g of water vapour. Put the cassette in a polyethylene bag, together with the required amount of desiccant bags. Weigh the cassette after some days to see that the desired weight has been achieved. Please Note: The drying agent can be regenerated by heating the bags in a stove at 110° - 130° Celsius. There is no risk of heating them for too long. C - Drying with the aid of a desiccant bag inside the display case. This is often the most practical way of keeping display cases within a certain relative humidity range over longer periods of time. Put the desiccant bags directly to the side or underneath the cassettes while they are in the display case. It is recommended not to add more than one or two 35 g bags at a time per cassette, in order to not reduce the RH inside the display case too abruptly. Your hygrometer could be poorly calibrated. Cheap hygrometers, in particular, can easily have a measuring error of 10% or more. If the weight of the cassette considerably increased or decreased we can assume that PROSORB has done it's job but other factors outbalanced the effect. Then either the case is too leaky, the hygrometer poorly calibrated or there might be hygroscopic construction materials inside the case.